Membership is open to any person or organization/agency/business living in or serving Fayette County who desires to work within the framework of a community collaborative to improve the quality of life of all citizens within the community. FACTOR Executive Committee and Finance Committee worked very hard in FY2008 to create a reasonable introductory Membership Program. Dues are not required for participation at collaborative meetings. They are required to utilize the Membership Benefits. All collaborative participants- paying members or not- are encouraged to become an active member of one of the many working committees. FACTOR MEMBERSHIP was established in FY 2008. 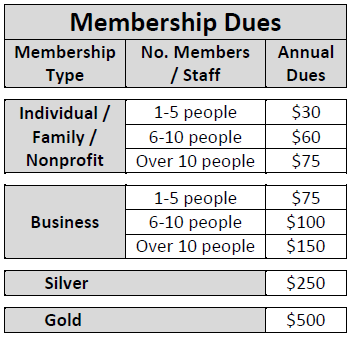 Dues for all categories are payable yearly. Participants in the collaborative meetings only and are not paid partners are FACTOR ASSOCIATES. ATTENDEES AT A COLLABORATIVE MEETING WHO ARE NOT MEMBERS WILL BE EXPECTED TO PAY $2.00 FOR MEETING EXPENSES AND LUNCH.